I could wax poetic about the ebbs and flows of the various segments of the markets along with a variety of developments on and off Wall Street; however, in doing so I may detract from purely reading what the numbers are telling us. What do the numbers say? 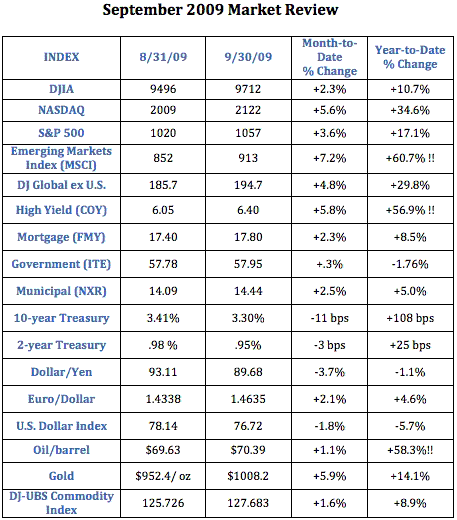 Much like last month, with the exception of the U.S. Dollar Index, every market segment once again increased in value. Wow!! The dollar is clearly the ‘juice’ which is being used to drive an inordinate number of positive carry trades. The International Monetary Fund’s financial stability reports are losing their capacity to shock. This is a shame. . . . The shock factor may be gone, but sustaining a recovery will be no cakewalk. Active traders may be excessively ebullient or despondent, depending on the daily swings in their profits or losses. I will enjoy the higher values in my monthly statements as they come in, but I am not changing my approach to increased discipline across all parts of my personal balance sheet. A balanced and well diversified portfolio with excess liquidity still strikes me as the best approach at this time. Now, take a look at the numbers. Week in Review: How Low?